This is our premier day kayaking experience. Launching from Wildcat Cove in Larrabee State Park, we spend the day exploring the intricate sandstone formations and fossilized remnants of ancient palm trunks within Chuckanut Bay. Because of the full-day format we have plenty of time to explore a variety of coastlines from river deltas to seal haul-outs while taking little breaks along the way to enjoy the views. We stop for lunch on Chuckanut Island, a beautiful and quiet refuge that is protected by The Nature Conservancy. After lunch we to hop back in the kayaks to refine our paddling technique and search for more of this regions hidden gems, including bald eagles, sea stars, harbor seals and the occasional porpoise or river otter. Come enjoy a full day of fun and discover what sea kayaking in the pacific northwest is all about! 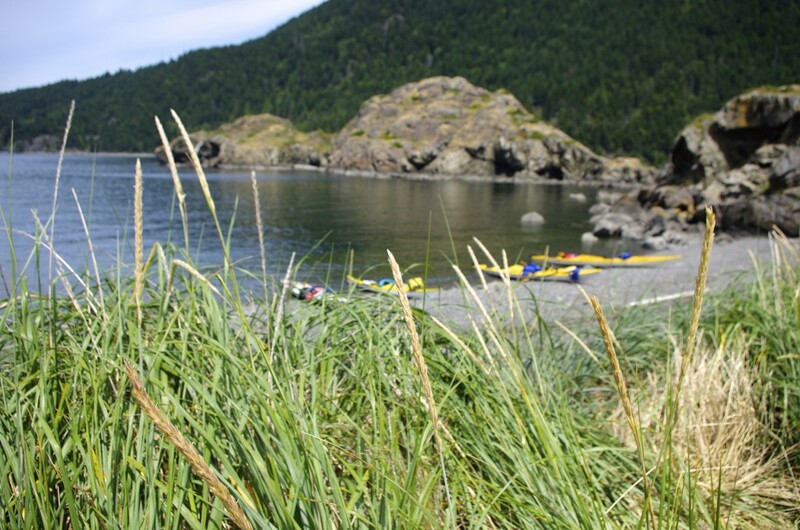 10:30am: Meet your guide at Wildcat Cove, help move boats to the beach, hand out safety equipment. 10:15am: Discuss kayak safety, paddling technique, and the day’s route (beginners always welcome). Afternoon Highlights: Exploring Chuckanut Sandstone Formations (geology), looking for intertidal life in nooks and crannies, lunch on a Nature Conservancy Protected island, potential for Fossil findings! 3:00pm: Land back in Wildcat Cove. Load boats and return safety gear. So long for now + thanks for joining the adventure! Price:$130 + WA State Sales Tax. 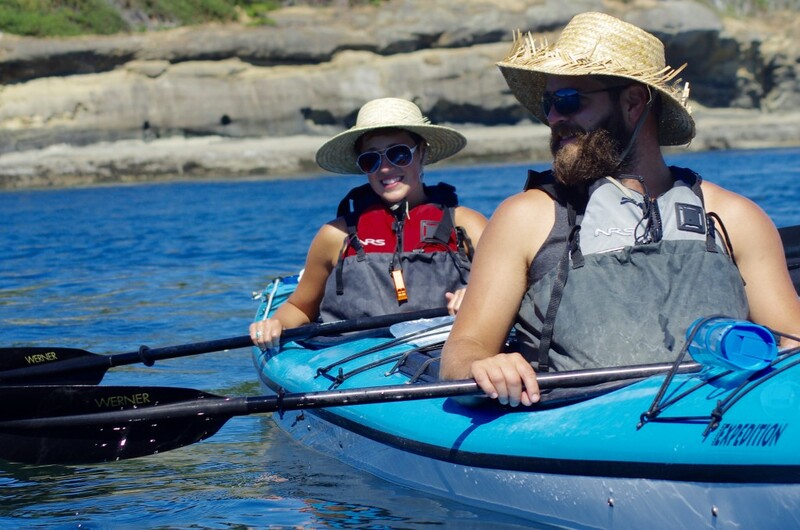 Includes: Stable fiberglass tandem sea kayaks, paddles, pfd’s, spray skirt, professionally trained kayak guide, along with a locally inspired beachside lunch. Does Not Include: Personal clothing, footwear, water/water bottle, sunglasses, discover pass, etc. Please refer to our gear list for what you will need to bring. Driving Directions and Gear List. For Women. Lead by Women. REI and Moondance Sea Kayak Adventures have joined forces to create a Women’s only kayaking excursion. 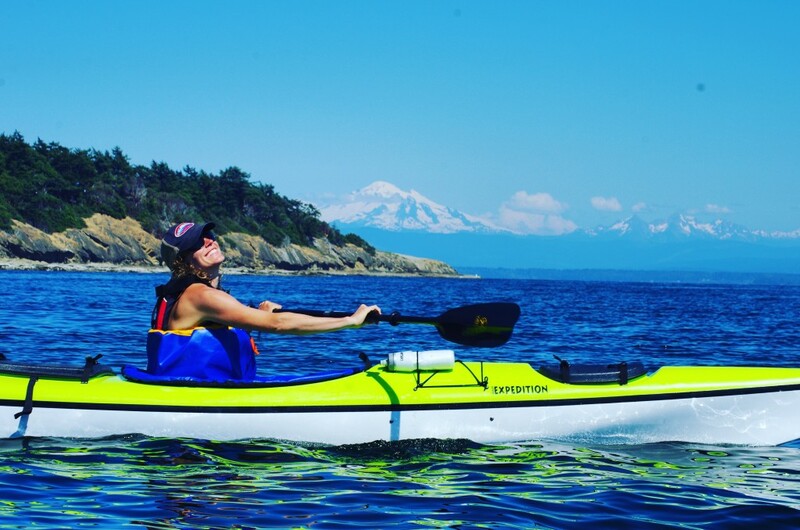 Moondance owner, Kristi Kucera and her friendly female guides will lead a group of ladies through the Salish Sea exploring our favorite local kayaking experience. Launching from Larrabee State Park, we will spend the day exploring the intricate sandstone formations and fossilized remnants of ancient palm trunks within Chuckanut Bay. Just as you work up an appetite we will take a lunch break on Chuckanut Island, a beautiful refuge that is protected by The Nature Conservancy. After lunch we to hop back in the kayaks to refine our paddling technique and search for more of this regions hidden gems, which often include Bald Eagles, sea stars, harbor seals and the occasional porpoise or river otter. For both ladies who have never been as well as seasoned paddlers, there will be something for everyone on this trip! Following our kayak tour our paddlers are invited to a local Bellingham brewery where we will celebrate and cheers to a great day and new friends! The first round of beer and appetizers are on REI along with a raffle prizes for an opportunity to win some Moondance apparel! Come enjoy, relax and get to know you’re new community of outdoor women to adventure with. 10:30am: Meet your guide at Wildcat Cove, hand out safety equipment, unload boats. 10:45am: Discuss kayak safety, paddling technique, and the day’s route. Gear up for the day! Highlights: Take a leisurely lunch break on an beautiful Nature Conservancy protected island, exploring Fossils in Chuckanut Bay, meeting new friends (both human and from the sea)! 3:00pm Land back in Wildcat Cove. Load boats and return safety gear. So long for now but please feel free to continue the day with your new friends at a local watering hole! $110.00 per person (plus tax) includes everything you need to kayak and a catered locally inspired lunch! Detailed information on the booking page. This slow-paced magical little island will inspire you to relax and enjoy the rhythms of island life. Arriving at a quaint little Ferry landing on the edge of Gooseberry Point, you will catch a short 6 minute ferry ride to beautiful Lummi Island, population 964. Intimate and removed from big town stress, enjoy paddling the rugged shoreline on the west side of Lummi Island. Earning your lunch, stretch out on the rocks and take pleasure in your locally sourced meal prepared by your guide. Look up and Marvel in the cliffs on the southern end of the island – look out to the northern San Juan Archipelago – this is a view not many people experience. Be careful, you may never want to leave. Enjoy the San Juan Islands without the hassle of long ferry or big crowds. 10:15am: Meet your guide at the Lummi Island Ferry Landing or Willow’s Inn reservations office. 10:30am: Arrive at Legoe Bay, get outfitted and move boats to the water. 10:40am: Discuss kayak safety, paddling technique, and the day’s route. 11:00am : On the water! Enjoy the views, explore the coastline, and learn about the plants, animals, and history of the Salish Sea. Afternoon Highlights: Exploring the undeveloped southern end of Lummi Island, 2,000+foot cliffs rising from the sea, lunch on a remote beach or small island, expansive views of Rosario Straight and the northern San Juan Islands and lots of wildlife opportunity! 3:00pm: Land back at Legoe Bay. Load boats and return safety gear. Return to Ferry landing or the Willows Inn, so long for now! Includes: Stable fiberglass tandem sea kayaks, paddles, pfd’s, spray skirts, professionally trained kayak guide and a catered sea side lunch. Does Not Include: Personal clothing, footwear, sunglasses, ferry pass, etc. Please refer to our gear list on what to bring. More information will be sent to upon booking! Our Wild Foraging Educational Tour is similar to our Full-Day Lummi Island Tour in route and length, but on this specific trip we will take more time to explore “sea food”, learn sustainable harvesting methods, rules and regulations as well as receive a Wild Foraging Educational packet, developed by Jennifer Hahn, author of Pacific Feast: “A Cook’s Guide to West Coast Foraging”. If the season allows we will enjoy a wild foraged snack along the way! Tours are scheduled around low tide events, often offered only a few times a month. Private trips available for parties of 4 or more. Includes: Stable fiberglass tandem sea kayaks, paddles, pfd’s, spray skirts, professionally trained kayak guide, wild foraging educational packet and a catered sea side lunch. Does Not Include: Personal clothing, footwear, sunglasses, ferry pass, harvesting license, etc. Please refer to our gear list on what to bring. More information will be sent to upon booking! *Note- This trip is meant to educate and inspire you to pursue and further your own sustainable seaweed harvesting, due to laws and regulations we will not actually harvest on our trips. Unless otherwise arranged with Moondance staff as well as providing proof of your seaweed harvesting license.